EXCLUSIVE! The Garden of Delight offers a bountiful feast. 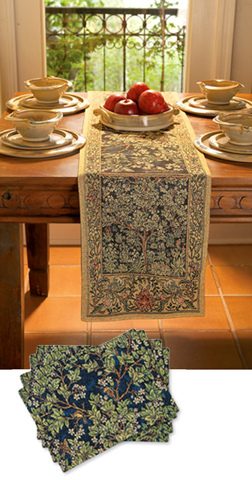 Enliven your dining with rich tapestry-woven runner and placemats, sumptuous with birds, blossoms and tree in full bloom. Inspired by the masterwork of William Morris, a founder of the Arts and Crafts movement. Cotton/poly runner is 90"l x 12 1/4"w; placemats (set of four) are 17 1/4" x 12 1/2" . Machine-washable. Made in USA. If you plan to use these as decorative pieces, then you'll love them. I washed the placemats, and the lining shrank much more than the tapestry piece, making them unusable as placemats. Owner Response:Thank you for your review, Martha! We apologize for the disappointment with this item. We're always happy to assist with an exchange or return if any of our products do not meet your expectations; please give us a call at 800-207-4256 if we can help. Heavy duty lined fabric, not the cheap stuff! I have been wanting this table runner for years and finally decided to treat myself and ordered it. It's just beautiful and the tapestry colors are so rich! It's heavy with a lining and really dresses up my dining room. It is well worth the money for such a high quality piece. I ordered the runner and several sets of the placemats.They are pretty, but when I washed them on cold and air dried them they shrank badly. Owner Response:Thank you for your review, Victoria. We're always happy to assist with an exchange or return if any of our products do not meet your expectations; please give us a call at 800-207-4256 if we can help. Very lovely table runner! Shipping was extremely fast. Looks great on our dining room table, Well worth the $$. Well crafted, heavy tapestry with brilliant colors. It looks amazing on my hardwood dining table.